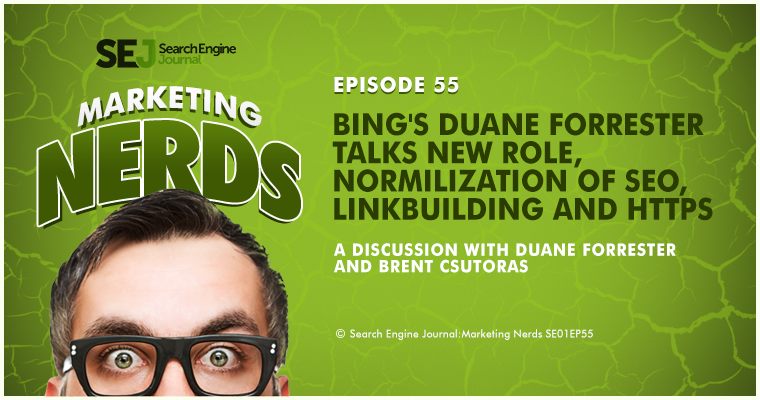 In this week’s episode of the Marketing Nerds podcast, Bing’s Senior Product Marketing Manager, Duane Forrester, spends some time with me discussing a number of very interesting topics for anyone in online marketing today. 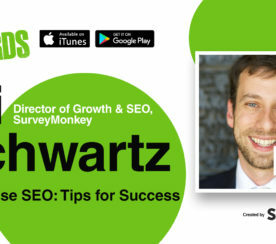 We discuss his current role with Bing, talk about the evolution of SEO and how it has normalized and became easier, whether or not link building is still a taboo topic, and what people need to know about having their sites secured with HTTPS. There’s the whole ‘SEO is dead’ conversation that keeps popping up. The fact of the matter is it’s never going to die, but it is going to normalize. 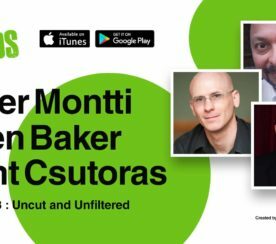 That’s what you, me, and other people, who have a lot of years in this industry, that’s what we’re starting to see and sense now is this normalization that’s happening. That’s happening because more and more people are getting experience. We also have to recognize there comes a point in time where, as things get easier to manage and become more mainstream, the amount of time needed to master the skill is lessened. I think we’re at that point now where five, ten years ago it was easy to look at people and say, “Dude, you don’t have a decade of experience, you don’t know what it takes.” Whereas today it’s a whole lot more plausible that, for the job that’s being posted, a person having three years’ experience is exactly the qualifications they need. Now, start taking that down the line across every tactic that you have. There are new tools. There are new processes. There are new ways to focus in the world of pay-per-click that never existed when we all started, back when it was a penny a click. The ability to target a demographic or target a region was a pipe dream at that time. Today that’s been standard for well over five years. There’s nothing new about that. Your ability to refine it within that idea continues to evolve, which is fabulous in the world of SEO. The algorithms are getting smarter. The signals are getting better understood. Not just like “Hey, we see this n— is it a growing signal, was it a waning signal?” but for the engine to look at that and say “Here’s how much trust I place in a signal. ” and how that gets balanced across different signals. All of that has matured and it makes it a heck of a lot easier on your traditional SEOs. It’s literally a lot less grunt work to get it done. 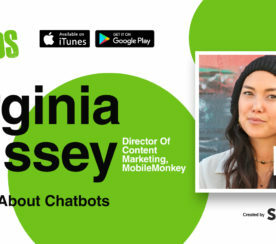 Having said that, the domain of the SEO has evolved to the point now where they are the leader when it comes to blending results and the impact that it has on a business across all of the marketing facets, anything to do with web, anything to do with social, anything to do with usability, all of this plays a role now. If anything, SEO is more complex than at any other point in time in history. It encompasses and touches on more things that have to be included in the mix to be successful. Should Marketers be Link Building? I had this moment where I was thinking about this recently and I keep waffling on this. If I put on my white hat, SEO hat, I waffle on this because I’ve never done any real link building in my life, never felt I needed to. My own personal websites were successful. When I worked at MSN, it was successful. We just didn’t do it. It didn’t matter. I do see how it can be useful for people, but I’ve always put it in that category of traffic development. If I get a link here and that delivers traffic to me, that’s why I’m in it, not to boost rankings. The fact of the matter is there are legitimate moments in time where you want to ask for links for whatever the reason is. There are plenty of legit reasons. There are people who will always try to game things. The engines are looking for the gamers. They’re not looking for the person who might get some ancillary benefit because they asked for something as a result of hey, you know what, I really want to be recognized by you and I want that credibility. There’s no real boost in ranking for doing this. Quite frankly, I don’t believe there should be any boost in ranking. If eventually the goal is to get to everything secure, well, then eventually we get to a point where there is no value to any boost because everyone has it so net sub-zero all over again. There’s no point in having that right now. The fact of the matter is this has to happen at its own pace as people understand what it means and understand how to make those changes with their systems. Over time, you will see everything starting to move in that direction. Then it’ll just become the new normal. That’s it. That is an important step.